↑ 2.0 2.1 There are minor variations from three basic time zones; see Time in Australia. ↑ "Pluralist Nations: Pluralist Language Policies?". 1995 Global Cultural Diversity Conference Proceedings, Sydney. Department of Immigration and Citizenship. ओरिजनल से 20 दिसंबर 2008 के पुरालेखित. पहुँचतिथी 11 January 2009. "English has no de jure status but it is so entrenched as the common language that it is de facto the official language as well as the national language." ↑ "2016 Census data reveals "no religion" is rising fast". Australian Bureau of Statistics. जून 27, 2017 के ओरिजनल से पुरालेखित. ↑ Collins English Dictionary. Bishopbriggs, Glasgow: HarperCollins. 2009. प. 18. ISBN 978-0-00-786171-2. ↑ "Population clock". Australian Bureau of Statistics website. Commonwealth of Australia. पहुँचतिथी 3 April 2018. The population estimate shown is automatically calculated daily at 00:00 UTC and is based on data obtained from the population clock on the date shown in the citation. ↑ Australian Bureau of Statistics (27 June 2017). "Australia". 2016 Census QuickStats. पहुँचतिथी 27 जून 2017. ↑ 7.0 7.1 7.2 7.3 "Australia". International Monetary Fund. अप्रैल 2018. पहुँचतिथी 22 April 2018. ↑ "2016 Human Development Report" (PDF). United Nations Development Programme. 2016. पहुँचतिथी 23 मार्च 2017. 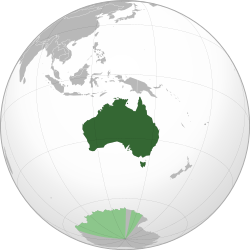 ↑ "Australia in Brief: The island continent". Department of Foreign Affairs and Trade. पहुँचतिथी 2009-05-29.